For large job site deliveries throughout Metro Atlanta, Georgia, requiring a dock high or flatbed truck with removable side rails and a lift gate, Cannon Delivery Service, Inc. has you covered. 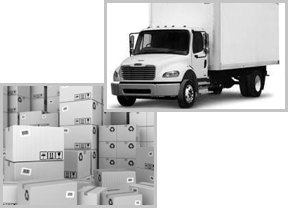 These larger vehicles are available for local and out-of-town deliveries as well as rental service. For additional information about these vehicles, please call customer service. See our other delivery options if you have a smaller package to ship. Cannon Delivery Service, Inc. has 24' and 26' dock trucks as well as a 24' flatbed stake side truck. The base price for our 24' and 26' dock trucks includes 30 miles, four pallets or pallet spaces, and up to 4,000 pounds. All-day service differs from these base charges and allowances. Our 24' flatbed trucks can safely transport up to 10 pallets or 10,000 pounds and are equipped with lift gates. The flatbed truck is a very popular vehicle, and due to its popularity, we recommend that you book truck deliveries in advance.